If you’re going to eat an animal, the least you can do is to make sure that it was treated well when it was alive, and that you use its meat with care and respect. Can you always do this, though? Do you get a clear picture of where your meat came from, how it lived, what it was fed? Probably not, especially if you buy meat from a supermarket. You won’t get this at a good number of butchers shops, either, but there are butchers out there who understand the importance of good animal husbandry and how it impacts on the quality of the finished meat, how the quality of an animal’s life influences the quality of its meat in death. These butchers are few and far between, but they’re out there. is written by a Tim Wilson, a butcher who clearly understands the relationship between good farming and good meat, so much so that he bought a farm and decided to do the whole thing end to end, a model that Wilson wants to see more of. Selling end to end creates a stronger responsibility for quality, a deeper and more direct provenance. Wilson’s is a successful business comprising a North Yorkshire farm and a clutch of butchers shops that supply a number of top restaurants around the country and his experience and ability are key to this book, a cookbook with a keen eye on the parts of the food production chain that most other cookbook writers leave out. 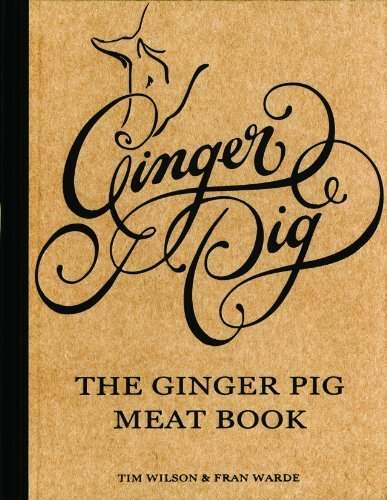 The first hundred pages are the most interesting, chronicling The Ginger Pig’s approach to raising pork, beef, lamb, poultry and game. Each section talks about the particular breeds, their strengths and why the Ginger Pig farms them. There’s a strong emphasis on heritage and rare breeds, an attempt to help to re-establish some of these near-lost animals on the nation’s plates. Discussion of husbandry moves easily into descriptions of the butchery process – how to prepare a cote de boeuf or a rack of lamb, joint a shoulder of lamb or how to bone and roll a shoulder of pork. The presence of red blotches, especially in the loin is an indication of stress for the animal, usually incurred at slaughter. Under stress, all animals produce adrenaline that adversely affects the flavour and texture of their meat. Stressed meat also has a surface sheen similar to the effect you get when a splash of petrol floats on the top of a puddle of water. That’s the sort of thing that only somebody who raises animals can tell you, and it made me look more closely, with some horror, at the plastic wrapped chunks of meat in my local supermarket. Many of the signs of stress that Wilson talks of were plain to see, if you’d care to look hard, and critically enough. So, the Ginger Pig Meat Book covers more of the meat preparation process than the part that starts in your kitchen, but it covers that too, admirably well. Wilson enlists the help of cook and food writer Fran Warde for this, and it’s a strong showing of over a hundred seasonally arranged recipes. A few dishes leapt out immediately, including a long, slow braise of beef shin, sliced unusually into rounds and cooked as a casserole with plenty of small onions, porcini mushrooms and balsamic vinegar. A recipe for pork chops, marinated in maple syrup, Kikkoman soy sauce, lemon and orange went straight on the ‘next time we have pork chops, they should be like this’ list. One thing that caught my eye was a recipe for salt beef from scratch, which involves a whopping four kilogramme joint of brisket or silverside, eight days of brining in a massive bucket and a good, slow four-hour simmer. It’s ‘project’ territory, along with the recipe for we-cured ham (six and a half litres of brine, seven kilogrammes of leg of pork and ten days waiting. Serious stuff).
. Both share the same respect, the same understanding of the importance of the raw materials. And, ultimately, that’s what cooking should be about… understanding your ingredients and getting the best you can out of the best ingredients you can get hold of. will help you do just that. POLL RESULTS – Dinner or tea? What do you call your mealtimes?